Apple and a handful of other tech companies are said to be in talks with Russia's Skolkovo Innovation Centre about building research facilities in the organization's "Technopark," which is at the heart of a larger initiative looking to bring high-tech innovators into the country. Russian language news outlet Izvestia reported on Friday that Skolkovo representatives are looking to bring industry heavyweights Apple, Google, Facebook, Symantec and others to the technology park in hopes of creating a high-tech research community (machine translation) akin to California's Silicon Valley. Companies already signed on to the project include Microsoft, IBM, General Electric, Cisco among others, though more investors are needed to fulfill the over $60 million needed to build the multi-building R&D center. Skolkovo Operating Director for Key Partners Roman Romanovsky notes that the program has to include 30 to 50 large companies for the technology park to be successful. Despite the standard "no comment" from Apple representatives, Romanovsky said that both parties are interested in negotiations, and the same goes for Google, Symantec and Facebook. The Skolkovo IT research facilities will be one of six "clusters" in the technology park, the five others being R&D centers for nuclear tech, space tech, biotech, energy efficiency and post start-up. 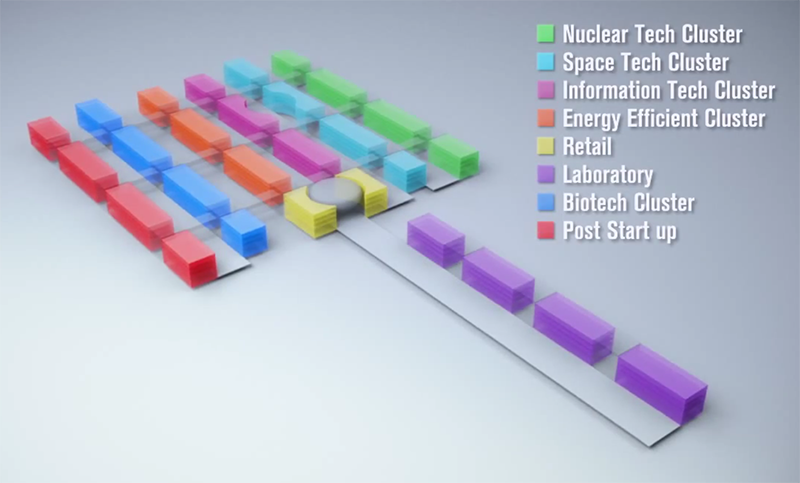 Located near the six clusters are central retail spaces and a separate shared laboratory facilty. Combined, the clusters will take up 90,000 square-meters of space. Romanovsky estimates that the participating companies will bring in about 5,000 researchers who will be housed in the Skolkovo center's condos and housing complexes which are interspersed throughout the grounds. Over 190,000 square-meters of land has been allotted for condo space, houses and villas. Skolkovo is an immense undertaking and will be a city unto its own complete with a public square, retail plaza, multi-use event halls and even an indoor ice skating rink. Most of the buildings in the "smart city" will be giant glass structures that are connected by wide landscaped walkways. While it is unclear if Apple will be taking part in the Russian venture, the company has shown interest in international R&D with its 2011 acquisition of Israel-based flash memory maker Anobit. A recent report noted that Apple was actively recruiting new hires for the the firm's research arm after axing a number of sales, marketing and administration employees.